Enriched with abundance of Ayurvedic ingredients such as vitamin E rich Olive oil, Haldi and Milk protein this gentle baby lotion protects, moisturizes and nourishes baby tender skin. It helps renew the essential moisture that baby's delicate skin tends to lose during bath time. Keeps skin infections at bay and also takes care of rough patches that babies tend to develop, leaving their skin healthy and soft. About the Brand: With the motto of 'Transforming Lives' VLCC aims to spark self-transformation, spread happiness and imbibe every individual with wellness. It is widely recognized for its therapeutic approach to beauty and weight loss solutions. Started in 1989, VLCC has now expanded its horizons to skincare, hair care, body care, functional foods and fortified foods products. Explore the entire range of Lotions & Creams available on Nykaa. 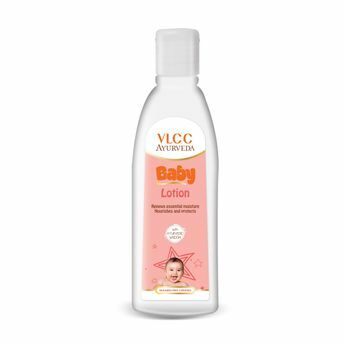 Shop more VLCC products here.You can browse through the complete world of VLCC Lotions & Creams .Alternatively, you can also find many more products from the VLCC Ayurveda Baby Lotion range.